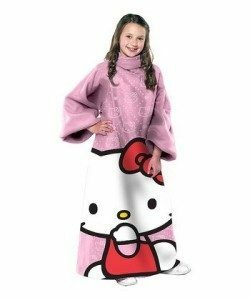 Hello Kitty Sleeved Blanket Only $14.99! You are here: Home / Great Deals / Hello Kitty Sleeved Blanket Only $14.99! Don’t miss a chance to grab this great deal for the Hello Kitty fan in your life! Hello Kitty Sleeved Blanket Only $14.99! Check out this huge clearance sale on Hello Kitty items happening right ow at Zulily! Tons of stuff starting as low as $8.99 including girls and women’s apparel, gift items, blankets and more! Grab all the hottest deals every day at Zulily!